For a few years, I looked after an allotment. The ground was full of rocks and half the plot was shaded by a line of enormous trees that plunged the canal into darkness on one side and the bottom half of our plot into a kind of permanent semi-gloom on the other. We did OK with potatoes, had spectacular success with French beans for a couple of seasons, but really, it was all about the fruit. Kilogramme upon kilogramme of raspberries, gooseberries and redcurrants. There was an annual handful of blackcurrants, too. Just a handful. The raspberries were normally used up in ice-cream, and I managed to perfect a makeshift recipe that I could knock together quickly and make without the aid of a machine by beating the slowly freezing mixture with a fork a few times over the course of an evening. My ice-cream was a little rough and uncultured, but it tasted great, and it’s the one thing I really miss about that plot. I haven’t made ice-cream since I hung up my spade. 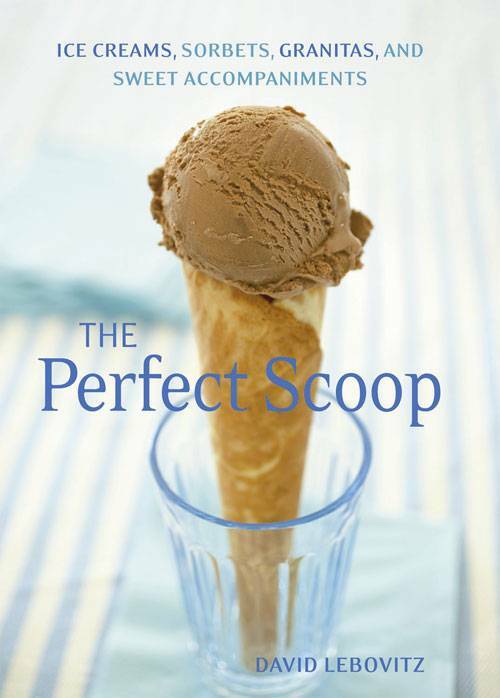 It’s hefty book, running to almost two hundred and fifty pages, devoted entirely to ice-creams and granitas. That amount of space takes some filling, and there are recipes here that range from the predictable crowd-pleasers (vanilla, chocolate et al) right out to the left-field (avocado, pear and pecorino, olive oil. Wait…avocado…as in avocado? I’m not sure I understand that). Lebovitz takes a couple of pages early on to explain in detail the all-important custard recipe that’s the base for many of the ice-creams to come. It’s a good tactic, and it helps to demystify the process in a ‘crack this one and you’re off’ kind of way. There’s similar attention given to equipment, including good guidance on what type of machine to invest in. This essentially distils to a simple, cheap machine with a jug that needs pre-freezing should be good enough for all but the committed aficionado, who should probably invest in a self-refrigerating machine that lets you churn out batch after batch without that annoying twenty-four hour wait for the canister to freeze again. Lebovitz is an entertaining and clear writer, with a good grasp of his subject and a straightforward way of stepping through a recipe. He’s a respected food blogger, as well as a writer of proper cook books (blogs vs. ‘proper’ books. Discuss. Hmmmm…. ), and it’s easy to see how his blog has become so successful on leafing through his book. There’s an engaging and easy style to it that’s been honed on the Internet and which has translated well to the page. It’s really quite engaging. sorts that problem out, and, if it continues to be as hot as this (21c today! No jacket to work! And it’s only the end of July! ), it might just get put through its paces this year yet. Interesting and well written review. I have been lusting after an ice cream machine. I was thinking I should start trying to write reviews even just to work on my writing skills. I left school a long time ago and have not really had any reason to write so I need a lot of work. Going to have to pass on the avocado ice cream. In fact, I may skip the book altogether and simply linger over the description of your homemade raspberry. Lovely post.